I am a risk adverse person by nature, so becoming a landlord is not a natural thing for me. But here I am, a landlord with two rental properties, and looking forward to more. This article is my story about how I became a landlord and why I did it. I have always had a mixed feeling about becoming a landlord. I hear too many horror stories about bad tenants that you can’t evict, midnight calls, maintenance problems, and much more. On the other hand, I don’t personally know anyone that does any of these bad things as a tenant. Also, the idea of owning a real asset that generates cash flows, appreciates in value over time, and comes with tax benefits is very appealing to me. For years â€“ nay, decades â€“ I have thought about this, but never pulled the trigger. In the meantime, I built up my fledgling personal finance blog in to a profitable business. But my site is way too dependent on the good grace of search engines that I am fearful my income could dry up overnight. So the same risk adverse-ness is now driving me to find another business that is stable and based on real physical things (preferably), and it has to take very little time to manage so I can continue my other pursuits. Finally, I was able to set aside enough money last year to start thinking about getting into a rental property again. Letting my money sit, even in the highest interest paying savings account, just wasn’t enough for me. And adding more money to my stock investments didn’t meet my goal of diversifying my income sources. Several conversations with my wife later, we found ourselves looking at homes and going to open houses on the weekends. We saw a dozen houses and spoke to just as many agents. We realized a few things: (1) we have a lot to learn, (2) some agents know more than others, and (3) it would be nice if we could find someone to coach us through the process. After several weekends, we were close to giving up the whole idea of becoming a landlord. However, we found an unusually inexpensive house on Zillow in a nearby neighborhood, so we submitted a request online. When we went to see the house we ended up in a scary neighborhood, which we didn’t even know existed this close to where we live. Being there after dark didn’t help either. The agent was waiting for us with a big smile, which wasn’t too comforting . . . maybe he was there to rob us! Just kidding. But things changed quickly inside â€“ the agent spewed out great tips and ideas one after another. My wife and I quickly realized this was the “coach” we have been looking for. Obviously, we didn’t buy the house we saw that night. We were too scared to rent out such a place. Over the next 8 weekends, we met up with Mike (our agent and coach), to see more houses. He taught us about the local neighborhoods, what to look for in a house, how to become a landlord in Virginia, how to find tenants, how to deal with tenants, house buying and negotiation techniques, and many more land-lording tips and tricks. We ended up buying a house about 40 minutes away from where we lived and managed to rent it out before we even paid the first mortgage bill! Our first rental was profitable after seven months. The house is cash flow positive from the start, but that is how long it took for the monthly profit to cover all of the closing costs, repairs, and other operational expenses. As a bonus, money is not coming out of our pockets, so our tenant is effectively paying our mortgage and building our equity in the house. Lastly, we were able to depreciate the cost of the house (not including the land) over the next 27.5 years. This turns out to be a significant tax deduction for us. Now that we have a good handle on our first rental, we worked with Mike and bought a second rental this year. Things are going along well and we already found a tenant for it. Hopefully, we will be able to buy more soon, or even explore the possibility of buying a larger multi-units rental property or even an apartment building. I am hoping to build our “real” business like we did with our online one . . . start small an keep working at it until it grows into a full-fledged business. I hope you enjoyed this story about how I became a landlord and that it helped you in some way. If you want to become a landlord, check with your local government because they usually have a lot of resources available for both tenants and landlords. And take the time to find someone that can take you under their wings and coach you throughout the process. 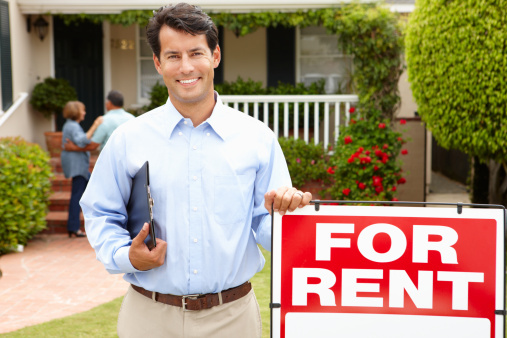 Are you thinking about becoming a landlord? Why or why not? Leave a comment! Awesome blog. From my perspective real estate is the best form of passive income because you have the most control over your money and decisions. For the comment about being cut out to be a landlord or not there is always the option of adding a property manager to your team under your terms. Hope this helps best of luck to you. Do you mean that the value of the land is going to drop and you were able to get a tax write-off because you called that an “expense”? Right now I don’t have the money. But even if I did, I don’t think I have the right personality to be a landlord. I think it would take too much patience. Patience waiting for the rent checks, waiting for the break even point, waiting for the investment to appreciate. I know it’s not much different than investing, but just doesn’t sound right for me. But good luck to you! Interesting post! I’m exactly like you were…interested in rental real estate but not sure I want to deal with the realities of it. Your story is encouraging. Sounds like Mike was the key to your successful experience. Mike was definitely an important part of why we took the leap.